Georgia celebrated her birthday this week. 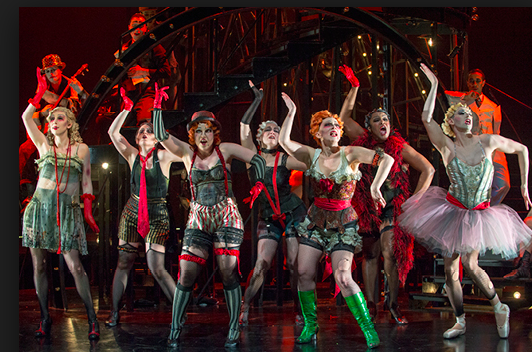 I had bought tickets to Cabaret at the Shaw Festival in Niagara-on-the-Lake, Canada. I told her where to find them in my apartment in Toronto. They weren’t where I thought they were, but she called me on my land line and I told her to look under the paper weight and there they were. I had invited Blake to go with us. He had agreed to drive. And Georgia asked her daughter to go with them on my ticket. When I bought the tickets in May, I thought to myself that it would be a treat to compensate me for the end of summer, as well as a good way to celebrate my younger sister’s birthday. Blake, my ex-husband, has known us since we were 16 and 10 respectively and we three always enjoy each others’ company. Only problem – I am here where summer seems never to end and a typical morning greeting is “another beautiful day in paradise”. You hear that a lot in Southern California, but never more than here high in the mountains, a place which the Chumash called the Center of the World. It is a town built around a golf club and its sole industry is leisure. Some people actually set out at 5 a.m. to drive down to work in the cities, even as far as Los Angeles, but many more do not. They get up early to play a round of golf and only then do they eat breakfast at the club house. They are resolutely friendly, waving as they pass you in their golf carts. Others are economic refugees, here because you can buy a house for less than a hundred thousand or rent one for less than a thousand. There are many musicians and many free musical events. They will insist on playing without as much as free beer for their reward. There are talented writers and artists as well and festivals and events that showcase their work. There are weekenders with big houses, executives, movie people, we suppose. We don’t meet them really. And yet I missed Cabaret. Georgia reported that it was wonderful, the set amazing. Blake took them to a good, untouristy restaurant for lunch. I am suddenly struck by homesickness. The maple tree across the street from the duplex where I live will have turned red by now. The one in front will soon turn yellow. The swallows will have left on or about August 28th. The geranium on the front porch -did anyone water it?- will be dying back even if they did. Tall grasses beside the bike path will be dead. Crows will be calling more than usual. Perhaps like the swallows, they are coming south. It goes down below 60 F here at night. The cool air comes down from the heights above as soon as the sun goes down. I close the window before dawn. But by the time I go out the door, it is beginning to get hot, reaching the upper 80s by afternoon. And it is dusty. That’s the nature of a desert climate, even a high desert with pine forest. It’s rained once in the three months I’ve been here. A short trip on the golf cart leaves me, the cart and whatever I have with me -groceries, my laptop, my laundry caked in dust. In Bakersfield, an hour north, the valley floor kicks up so much dust that the mountains beyond look misty. My Grandpa Munn couldn’t bear to leave his home, a farm in the mountains in Quebec. He would pine away when he did, growing more silent and pale as time wore on. The longest he was ever away was a week, but to him it felt like eternity. I’m not that homesick. I didn’t even notice it until I missed Cabaret. And these mountains are very like his mountains,so they are like that early home of mine. Besides I’ve had the good fortune of having to be here amidst such beauty and in the middle of my family. Why complain? The north seems to built into my bones. I miss the quickening of fall.